Add whimsy to your décor and cut down on clutter with the DIYShelf Shelfbot modular shelving system. Made by hand in the U.S., Shelfbots look like minimalist robots. Arms, legs, torso—they’re all there, making an imaginative, customizable way to display plants, photos, books . . . anything you like. Whimsical enough for kids’ shelving, Shelfbots are fun for grown-up spaces, too. Founder Adil Vezir makes Shelfbots in Pennsylvania out of pine sourced from sustainably managed forests. Pine doesn’t give off formaldehyde fumes the way cheaper, medium-density fiberboard and plywood can. The Shelfbot finishes are nontoxic, too. Shelfbots are made to order; you can choose to have them arrive assembled or you can easily put them together yourself. You can also choose how to set them up; hung on a wall (straight up, sideways, or upside down) or freestanding. Either way, they put the fun in functional. Hello Grommet Community. My name is Adil Vezir, inventor and Founder of DIYShelf LLC. I will be delighted to answer any questions you may have about this innovative modular furniture design! I’ve never looked at a shelf and thought "how can I make this fun?" What was your inspiration and is that mindset something you always have? The original inspiration was to make a storage solution for my kid’s endless collection of “stuff”. I wanted to create something visually interesting but at the same time flexible and modular. Something that can grow and change with you. I wanted to make something that has traditionally been very fixed and rigid into something more fluid with more flexibility and a sense of movement. When friends and family saw what I had done and loved it, I knew we had something special, and that it shouldn’t be limited to just a kids market. As an artist and prototype designer and someone who is always making things, I do tend to look at things in a more creative, out-of-the-box kind of way. I just made it for fun as a way of re-cycling salvaged material and creating storage, but all the positive feedback I got finally gave me the aha moment that it could become a real product. The process of making DIYShelf into a business was a more gradual process taking over 3 years, of development, research, prototyping, and refining, to get to where it is today. Why should people have a DIY shelf over a regular, boring shelf? Most of the furniture out there is poorly made mostly from materials containing formaldehyde which is carcinogenic, our products are handmade from sustainable sourced select pine and are toxic free. For some people their generic old boring furniture is sufficient and that’s ok, but what makes DIYShelf unique is that it allows you unparalleled freedom to personalize and create a completely unique storage and display unit anywhere in your home, dorm or office. Everyone needs more storage space no matter how much you already have. DIYShelf offers people multiple levels of creative involvement to choose from that fits them the best. DIY it or have us fully assemble each unit. Easily hang each ShelfBot in 4 different orientations. Paint/ finish or stain it themselves. Arrange, stack and connect multiple units in new ways and combinations. No other shelving product offers as much freedom to be Unique, Creative and FUNctional at the same time. I understand that The Grommet ships free for orders over $50.00. Is there an extra cost if it is shipped fully assembled? Thank you! @David Head and torso, arm and leg sections are already pre-assembled in the DIY version, all you have to do is connect the sections together, and yes it is with included screws. Minimal assembly required! So how is this different from me going to my local Lowe's/Home Depot and buying wood and nailing to together? What is unique/special about it that the regular DIY person could produce? @Leslie Good question! 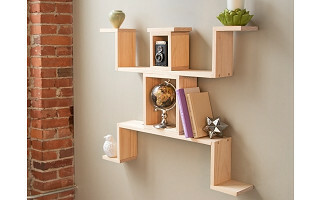 These shelves look deceptively simple but it took a lot of craftmanship and prototyping to get it to where it is today. They are designed to be modular and can fit together in the most optimal way so the chosen proportions are not random. A good woodworker may be able to imitate it but is a unique patent-pending product. We made it so a regular DIY person doesn't need to try and go to the trouble of reproducing it as we have a DIY version available that they can immediately customize and personalize in many other creative ways. I appreciatye every aspect of this product and plan to share with family and friends who will enoy the uniqueness and quality. The difficult part for me will be deciding which design I want. Thank you for your responsible creativity. Thanks so much for the kind words, Mickey! Made in America, handcrafted, AND made of sustainable materials! That's a hat trick! 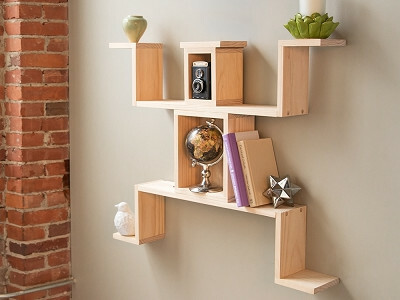 This shelving is very clever as well as functional. Can I paint the plywood or stain it? @Catherine Thanks for your comment! The shelves are NOT made of ply-wood but 100% natural select pine, with no knots, so they are perfect for painting or staining, any way you choose! I think these things are really cool! I love the way they look like figures standing against the wall....that is really unique. Shelves have always been boring looking but these are NOT boring at all....they are really awesome! Thanks for the comment, Sandra, I couldn't agree more! They really are awesome. I'm looking at all of my shelves in disgust right now. They look ridiculous. Add whimsy to your décor and cut down on clutter with the DIYShelf Shelfbot modular shelving system. Made by hand in the U.S., Shelfbots look like minimalist robots. Arms, legs, torso—they’re all there, making an imaginative, customizable way to display plants, photos, books . . . anything you like. Whimsical enough for kids’ shelving, Shelfbots are fun for grown-up spaces, too. Founder Adil Vezir makes Shelfbots in Pennsylvania out of pine sourced from sustainably managed forests. Pine doesn’t give off formaldehyde fumes the way cheaper, medium-density fiberboard and plywood can. The Shelfbot finishes are nontoxic, too.